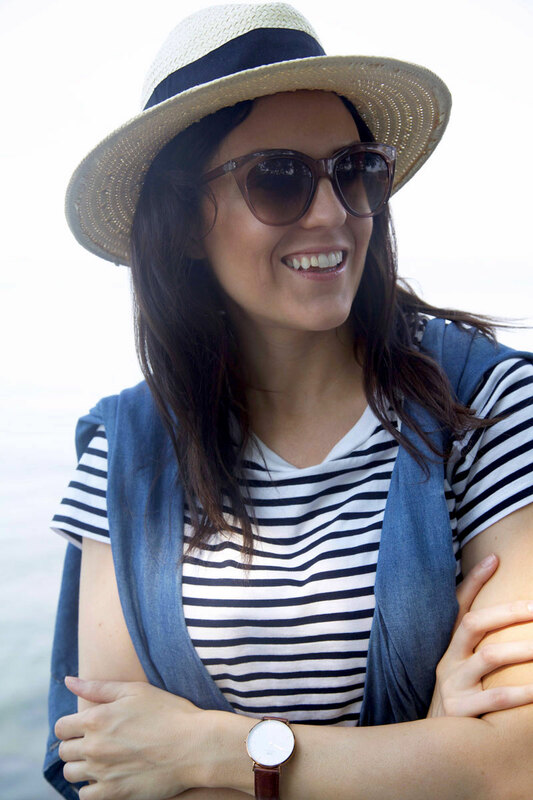 This nautical outfit is comprised of pretty much all my favorite things- stripes, white and denim. I'd been on the hunt for a pair of wide legged white pants for quite some time, but the struggle to find trendy pieces that fit the body type of not-a-size-zero-model is oh-so-difficult (as I'm sure you can all relate). I finally scored these pants (on sale no less) and I have to say, if you've been wanting a pair of pants like these, get them. They're incredibly flattering, they're slimming at the top and wide at the bottom (not wide all the way, like most pants that I had tried on) and they're so comfortably soft. An all-around win for my closet. Funny enough, growing up, the box of dress-up clothes that my sister and I would play with included my great-uncle's navy uniform. 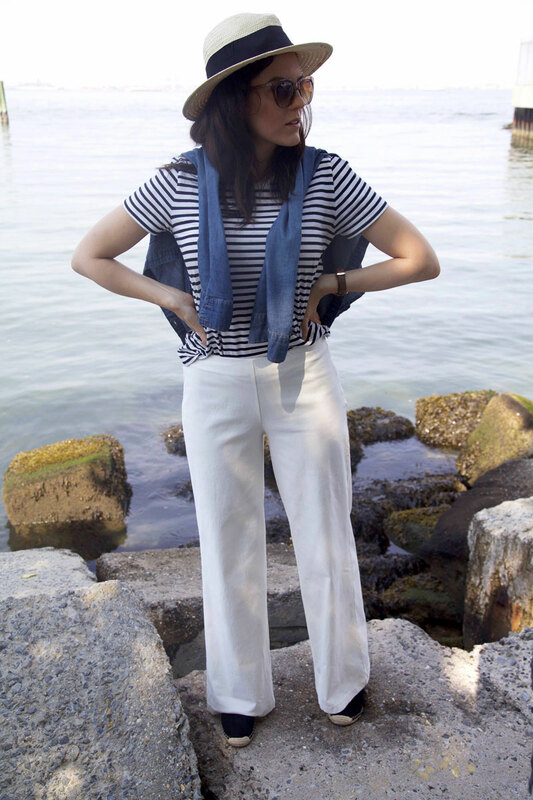 With its wide legged white pants and navy blue details, it was, not surprisingly, one of my favorite things to"dress up" in. All these years later and here I am, still dressing up in white wide legged pants and accenting with all kinds of blue. Old habits die hard. Except for the 100% wool that the uniform was made from. That, thankfully, died, which is a good thing because nobody, and I mean nobody, wants to see me wearing 100% wool anything in the summertime. I'd be sweating like a pig at a pig roast. I realize that sentence doesn't really make sense because the pig is already dead before it gets roasted, but humor me and just go with it. Also, not quite on topic, but I have to ask? Did you guys enjoy playing dress up as kids? Did you have a favorite costume?